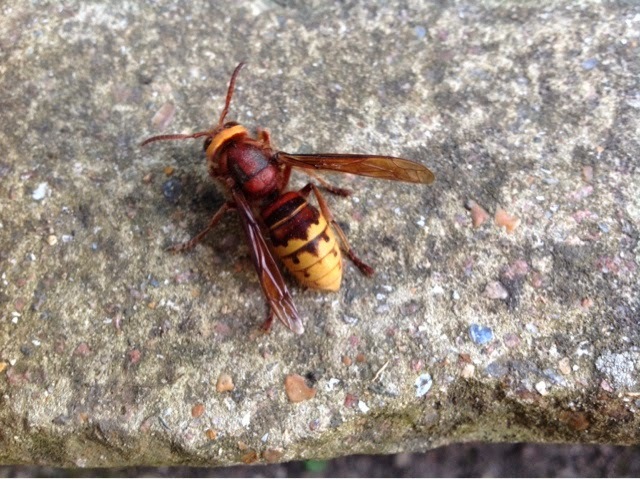 The hallway window was buzzing the other day and on investigation we found it was this Hornet. We managed to move it outside using a jam jar and it settled on the patio where we were able to photograph it. In fact the trauma of it all meant that it moved itself to the wall and remained there until it warmed up the next morning. Hornets have a reputation for being aggressive but they are said to be less so that many other wasp species it is just their noise that makes them appear so. They can be up to 2.5 inches long this one was only around 1.5" so possibly a young one.